Another Monday, another week to plan out my family's meals! By the way, I am not planning out Saturday and Sunday meals anymore! I never made the lasagna on Sunday since we went to my sister-in-law's house and made burgers on the bbq, and Saturday I made a small pork shoulder instead of the steak, our weekends are really unpredictable! Now to plan this week!!! That's it for now, almost time to begin preparation for today's meal!! 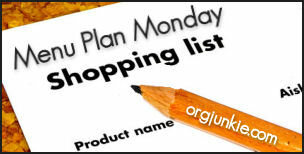 If you'd like to see more Menu plans, get ideas or link up and share your own Meal plans, visit I'm an Organizing Junkie!